1. Place the ElliptiGO on the kickstand and on a flat surface. Check the rotational direction arrow on the tire. The arrow will need to rotate clockwise when riding. Open the quick release lever on the front wheel. Insert the wheel into the fork drops. Press down on the head tube of the ElliptiGO to ensure the wheel is properly seated. If the wheel is not wanting to seat, the tension nut may need to be loosened to allow for more clearance. Now apply downward pressure to the frame and fork with the wheel resting on the ground, while at the same time closing the quick release lever. The lever should be facing rearward. Now re-attach the brake cable. Rotate the wheel while looking and listening for the brake pad rubbing. If rubbing is present, start again at step 3 (or move to C). 1. If the wheel is seated properly but light rubbing persists when the wheel is spinning, you may need to make adjustments to the brakes. You will need a Phillips head screwdriver for “C” series or a 3mm Allen wrench for the 8S/11R models. Adjust the spring so the brake pad does not rub on the rim. 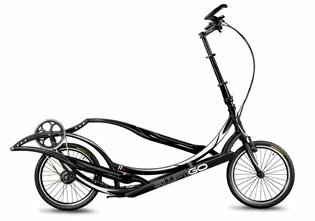 Stand so the front wheel is between your feet and you are facing the ElliptiGO. If the right side brake pad is rubbing, tighten the spring tension screw to move the pad away from the rim and loosen the left side spring to center the brakes between the wheel. If you cannot get the front brake cable to attach because the cable feels tight, there are a few situations that could be contributing to the problem including the brake cable not being seated at the handlebars or may need to loosen the brake cable nut. A. Check that the brake cable is properly seated in the brake lever. Loosen the brake cable bolt (turning counterclockwise) by using a 5mm Allen wrench. Use one hand to hold the brake calipers. Let out some of the excess cable, just enough to be able to attach the brake cable noodle into the brake housing. Re-tighten the brake cable bolt (turning clockwise). See secton III C if brakes are lightly rubbing on rim.